I went to Soufi's on a rainy day, and it's the perfect place to run into from the cold. It's a warm and brightly lit spot, and welcomes you in with the smell of freshly-baked bread out of the oven. Soufi's is Toronto's first Syrian restaurant, where the Soufi family is serving up street food with recipes they've brought with them from Damascus and Homs. 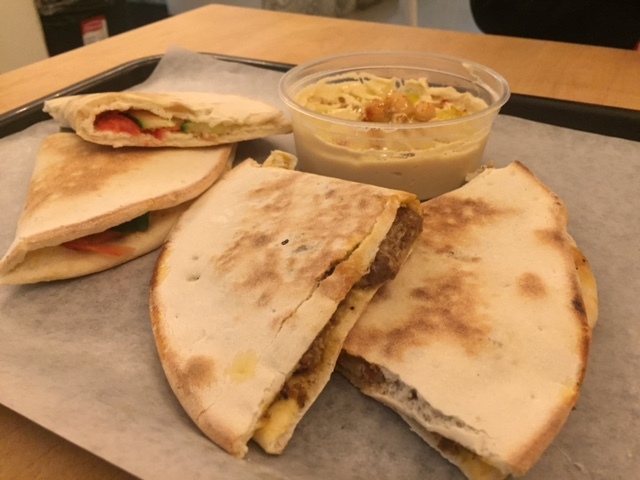 Their menu is focused on mana'eesh, a freshly baked flatbread that's topped with a variety of things. If you've never had mana'eesh before, try it the classic way first - with soft and briny Akkawi cheese; or with za'atar spices and olive oil drizzled on the bread. My personal favourite was the sujuk, which is topped with a spicy beef sausage. Their bread is kneaded and baked in-house, and it comes out so hot and melty that you have to give it a few minutes, or it'll burn your mouth. Needless to say, the freshness pays off with a soft and chewy bread that goes well with any of the toppings. Their hummus also deserves an honourable mention, and they have a few other items on the menu that aren't mana'eesh. You can tell Soufi's is a family-run spot, and a labour of love. The mother, Shahnaz (and maybe an aunt as well?) are hovering in the background, checking on us, and making sure that everyone is fed and happy. The family has lined their walls with photos from Syria, and the napkin holders have lovely hand-written Arabic sayings on them. Their daughter, Jala, mans the cashier and takes orders, and in her spare time, also makes the vegan versions of their spectacular Kunafah dessert - the melted cheese soaked in sweet syrup, baked with a crispy vermicelli crust, and garnished with crushed pistachios. Next time, I'll also be trying the PB&J man'ousheh for dessert. Soufi's is a great addition to Toronto's food scene, and I'm looking forward to going back again.